Do you love entertaining your guests outside or to savour some quiet moments of loneliness? How about reading a good book in the garden? If you spend a decent time in your garden, all these activities wouldn’t be complete without a parasol to protect you from the sun or even the annoying rain. 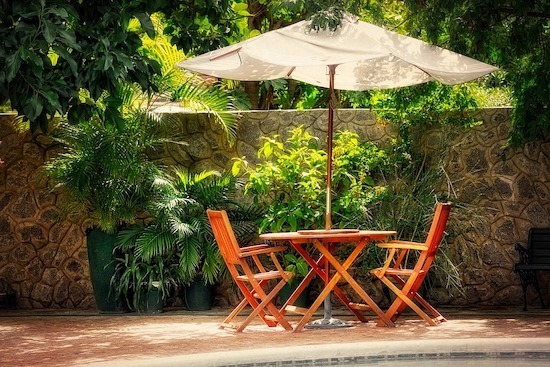 The best garden or outdoors parasols are made from sturdy materials and offer a wide shade. Plus, they’re very easy to assemble and adjust. Further down we’ll talk about the things you need to consider before buying but for now, let’s take a look at some of the best cantilever parasol below. Compared to the traditional garden umbrellas, a cantilever parasol is designed to hang over the furniture without getting in the way, using their own unique weighted base. However, due to its size, it is recommended to buy an aditional base for extra stability. This SORARA Roma Umbrella is one of the most expensive cantilevers on the market, but its features make it worth every penny. To start with, its generous dimensions are perfect for providing lots of shade, while the 360-degree rotation makes it easy to adjust with the crank mechanism. The construction is reliable, considering the fabric is made from a 250 g/m2 polyester that offers good UV protection and rain protection. The poles and ribs are made from aluminium and are coated with a rust-proof substance. On the other hand, aluminium is fairly heavy, and this umbrella is pretty big, so it ends up weighing 35 kg. This Sorara Umbrella has four separate elements, but it doesn’t include the base that you can fill with sand or stone for extra stability. Without this extra base, the cantilever can’t resist heavy gusts of wind. The set includes a useful protective cover, so you can leave the parasol outside throughout summer, the instructions manual and even the tools to set it up. This cantilever is definitely one of the best large garden parasols, but that also means it will probably take two people to assemble it. The Charles Bentley Parasol is among the cheapest cantilever parasols on the market, with some quality features like its large canopy that provides good cover. The canopy itself is made from 160g polyester, a resistant material that provides good UV and water protection. This grey garden parasol has 6 ribs that support the canopy, and a powder-coated steel frame that is also very supportive. However, the total weight of just 12 kg and its construction render it shaky when facing heavy winds. As such, you need a reliable base for it, but make sure that the base you’re considering fits its 48 mm pole diameter. For instance, the Parkland Cast Iron Effect Parasol Base can fit parasol poles up to 50 mm and it’s affordable too. The adjustable angle is another point in its favour, and so is its easy setup. However, the crank winding system is a bit flimsy, so handle it carefully. Compared to their cantilever counterpart, they are usually more lightweight and, therefore, more portable. Their biggest inconvenience is their frame standing in the way sometimes but a table with a hole in the middle would do the trick just fine. Another advantage vs cantilever is their wind resistance, proving to be more effective in high winds. The Costway 3M parasol is among the most ingenious patio or garden umbrellas thanks to its 24 solar LED lights. You can enjoy its refreshing shade all day long, meanwhile, these LEDs charge up via the round solar panel up top, offering you plenty of light during the night. Quite an impact for a beach or garden party, right? Another advantage of these LEDs is that you can easily turn them on or off thanks to the switch incorporated into the pole. The warm white light they provide is very easy on the eyes. Bonus: you can even mount this umbrella on your table. 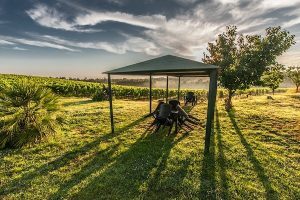 The Costway parasol offers a decent shade area and has a pleasant colour: beige canopy and black pole, with 8 supporting steel ribs. That, along with the hexagonal shape of the canopy, make this umbrella pretty resistant. The polyester canopy has good UV protection and is water-resistant, while the steel pole and ribs are very sturdy. Steel is also a heavy material, which offers stability, but requires a very resistant base to hold this cantilever. This UK-Gardens large garden parasol has a beautiful construction and it’s one of the sturdiest garden umbrellas on the market. That’s thanks to its powder-coated hardwood pole that offers an increased support, along with the 6 ribs. The 180g polyester used for the canopy is a resistant material, but it won’t perform great in heavy winds. Besides, the cantilever is just 9.5 kg, which is another disadvantage in high winds. This umbrella isn’t recommended in the rain either because of the hardwood pole, so you’d better take it inside. However, its 9.5 kg weight turns into an advantage, making it easy to move. That said, this product is very good for sunny, dry weather. The leather trim and brass clips used for its corners are reliable, and the top air vent offers increased ventilation. Considering that the umbrella can’t be adjusted according to the sun, it’s better to use it over your dining table. If you’re looking for a small garden parasol, this Sekey umbrella is perfect for the job. It has a two-piece pole, and its halves are 22 and 25 cm in diameter, which means you can easily fit it over any dining table. Besides, the total weight of this umbrella is just 2.8 kg. On the other hand, the parasol provides a wide shade area, considering the canopy has a 200 cm diameter. You can also bend it according to the sun thanks to its easy-to-use rotary joint. However, this small cantilever can’t withstand either heavy wind or heavy rain. However, the 100% polyester canopy can easily withstand light showers and has a 25+ UPF. The 160 g/m² polyester stringing with valance and edging, metal poles and 8 ribs are also supportive and sturdy. The disadvantage is that the parasol looks a bit plasticky, so I won’t be the prettiest flower in the garden. Parasol means “for sun” in Spanish, therefore their main attribution is to protect you from the sun shades. If you’re in the need for something more effective against wind and rain, you should consider buying a gazebo. The materials used are essential to realising how sturdy parasols are. Besides, they all have different characteristics that might prove inconvenient for you. For instance, polyester is a frequently used material for the canopy. The advantages of polyester are that it’s fairly resistant to sun and rain, but exactly how resistant depends on the fabric thickness. Poles and ribs are generally made from metal, like steel or aluminium, but there are also plastic or wood poles. Metal poles are heavier, which is great in terms of stability; on the other hand, it makes the umbrella more difficult to move. The size of your umbrella is important too. For some people, smaller parasols are better because they’re easy to move and fit everywhere. On the other hand, bigger parasols offer increased stability and a wider shade area. Large parasols are also more versatile because you can place them over a dining table or near a sunbed. Smaller parasols have the great advantage of portability, easy storage, as well as an easy setup. Many consider that the best garden parasol for their needs includes some degree of mobility and adjustability. A 360-degree rotation is the ideal, but even tilting can do the trick. Make sure that the crank mechanism that allows you to change positions isn’t flimsy, though. The patterns of sun and shade in your garden, along with the purpose for which you’re getting this umbrella, should tell you how important adjustability is. If you want to use it for sunbathing or in a place where the sun shines from all directions, you need a very adjustable umbrella. There are various included extras to think of. One is the instructions manual, which should be clear and easy to understand. Your umbrella might also include all the necessary tools for mounting, or a protective cover so you can leave it outside even when you’re not using it. Some garden cantilevers come with their own base, which is a definite advantage. But if you need to buy your own base, make sure that the pole diameter can fit it and that the umbrella itself isn’t too heavy for the base. The best garden umbrellas are resistant to environmental conditions. That includes bad weather, like extreme sun, rain or wind. However, you will find that most cantilevers are suited for mild weather and can’t be left outside in the wind, at least not without a sturdy base. You might also want to check how reliable the materials used are against rips or rust. Most coated poles can resist rust, and polyester is a material that resists tears. However, make sure to store the cantilever only when it’s completely dry, to avoid wear marks. In search of the best garden parasol, we’ve taken you through a series of umbrellas reviews. From expensive to cheap garden parasols; from large to small, these reviews are meant to find you the perfect parasol for your garden. With that in mind, which one do you like best?